Idaho’s Bounty’s second annual locavore fest is about to wrap up. A number of Wood River Valley restaurants have been serving up fabulous local food, and some have been featuring Lava Lake Lamb. Tonight is the final night of Ketchum Grill’s Locavore Week. All of their entrees are $16.91 or less, in honor of their 19th anniversary (Congratulations!). In addition to braised goat and grilled steak, they are offering braised Lava Lake Lamb shanks. CK’s will wrap up the festival from May 7 – May 13th. They are featuring beef brisket braised in Bellevue root beer, and Lava Lake rack of lamb. Support local producers and our wonderful local restaurants! This is your chance to fill up your punchcard and be entered into a drawing for a gift certificate to Idaho’s Bounty (see the Idaho’s Bounty site for details). Happy Eating! To celebrate, PBS is encouraging its viewers to invite over friends and host a potluck for the viewing. They’ve compiled a guide to hosting, which includes ideas on everything from discussion to recipes. The show is even giving away free gifts to participants, so sign up. If you miss tomorrow’s event, Food Inc will be available to watch online from the 22nd to the 29th, so encourage everyone to watch this important film and follow up by supporting sustainable agriculture! Signs of spring are popping up all over the Wood River Valley; it’s 65 degrees, shoots are emerging from the ground, and Idaho’s Bounty is selling more than squash and potatoes – greens are here! In celebration of local food, Idaho’s Bounty is hosting its second annual locavore festival. Each week, an area restaurant that prioritizes local food will be featured. 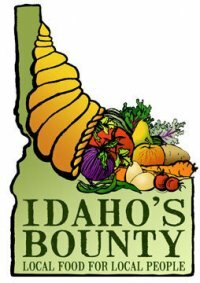 Restaurants will offer a special local menu for the week made with fresh, sustainably produced food from Idaho’s Bounty Co-op. Up first, chef Tyler Stokes of Globus will be serving Idaho black beluga lentil salad and braised organic Lave Lake Lamb massaman curry. Both sound delicious and we hope to try them. We’ll keep you updated on the festival as different restaurants are featured. Ciro, Globus, Glow, Ketchum Grill, and CKs will all be featured over the next few weeks. Punchcards will be available at each restaurant, and with three punches you can be entered into a drawing for a $35 gift certificate good at Idaho’s Bounty Co-op. If you get punches from all 5 restaurants, you’ll be entered to win a $55 gift certificate. Happy locavore dining! I like the idea that when people order something, like a pork dish, or lamb dish, or chicken dish, that you aren’t just getting a chicken breast or a lamb tenderloin or a pork loin. That you’re getting all parts from the animal when you order it and that you really have no choice in that, because the farm gives us no choice in it. It’s a good way to look at the future of food. How do we take what our farm can provide and create a menu off of that, instead of the way most chefs think about creating a menu, which is, what do I want to cook with, what do I want to serve? Using the whole animal is better for both the environment and your rancher. It also allows chefs to be more creative in their cooking. So consider buying a whole lamb next time you’re on our site. If you do, you’ll have plenty of resources to use, because as a follow up to our butchery class, we’ll work on a new blog segment, following us as we cook our way through a whole lamb. Check back soon for some new recipes. Last night on CBS, Katie Couric took an in depth look at the practice of feeding antibiotics to livestock. Factory farmers who want to keep their herds healthy and growing quickly have found that the easiest and most cost-efficient way to do so is to include small doses of antibiotics in the livestock feed. What’s wrong with keeping your hogs healthy? Well, as Couric points out, “some people say giving animals antibiotics to prevent illness or promote growth is like putting antibiotics in a child’s cereal.” Overuse of antibiotics leads to the creation of super-bugs, or antibiotic resistant bacterial strains. At one poultry plant in Arkansas, 37 workers developed MSRA, or methicillin resistant staph, an infection very difficult to treat due to its resistance to most antibiotics. More than one person developed an MSRA infection 12 times. The report also mentions a study carried out by the University of Iowa, which found that 70% of hogs and 64% of workers on several farms in the midwest contained a strain of MSRA. At farms that don’t use antibiotics, not a single strain of the infection was found. These are scary numbers. So what’s the bottom line? You need to know that your meat is antibiotic free. And the best way to be sure is to talk to your farmer. You can feel confident eating Lava Lake Lamb, because we never feed our animals antibiotics. To learn more, watch the clip here, or read the accompanying article. You can check out the second half of Couric’s two-part series, tonight on CBS. This week on Oprah: Rosie O’Donnell, Denise Richards and tomorrow, Michael Pollan. What a lineup! I know that we’ve been talking about Oprah more than you might expect of a sustainable grass fed lamb ranch, but we’re still so excited about our mention in the O Magazine article on online food shopping, and we can’t wait to hear what Michael Pollan suggests to Oprah’s millions of viewers. We were honored to host Michael Pollan at Lava Lake Ranch in the fall of 2008. Mr. Pollan was in town to give a lecture at the Sun Valley Center for the Arts, and spent the afternoon touring Lava Lake Ranch on horseback and learning about our efforts to raise lamb in an environmentally sound, sustainable manner. Michael Pollan’s investigations into our food systems and the culture and economics of eating have helped fuel a food revolution in America, with more and more people considering the impact their food choices have on their local economies, the environment, and the planet. Pollan is the author, most recently, of Food Rules and In Defense of Food: An Eater’s Manifesto. His previous book, The Omnivore’s Dilemma: A Natural History of Four Meals, was named one of the ten best books of 2006 by the New York Times and the Washington Post.